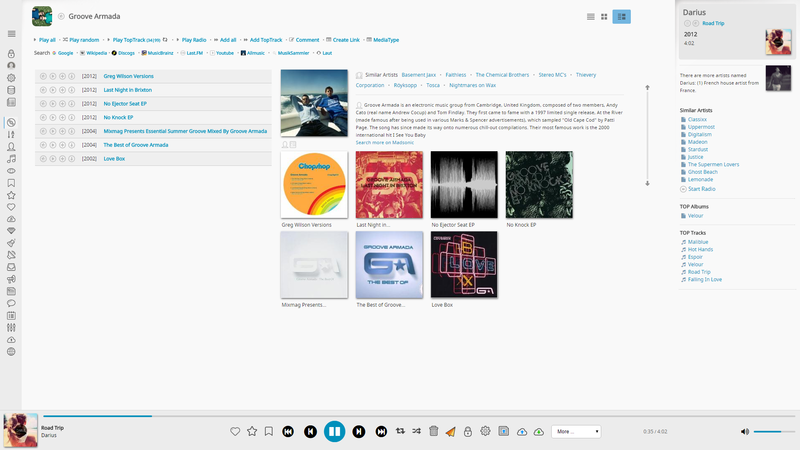 Madsonic is a web-based media library and media streamer with jukebox functionality. Based on Java technology, Madsonic runs on most platforms, including Windows, Mac, Linux, OSX, and Unix variants. If you have constrained bandwidth, you may set an upper limit for the bitrate of the music streams. Madsonic will then automatically resample the music to a suitable bitrate. 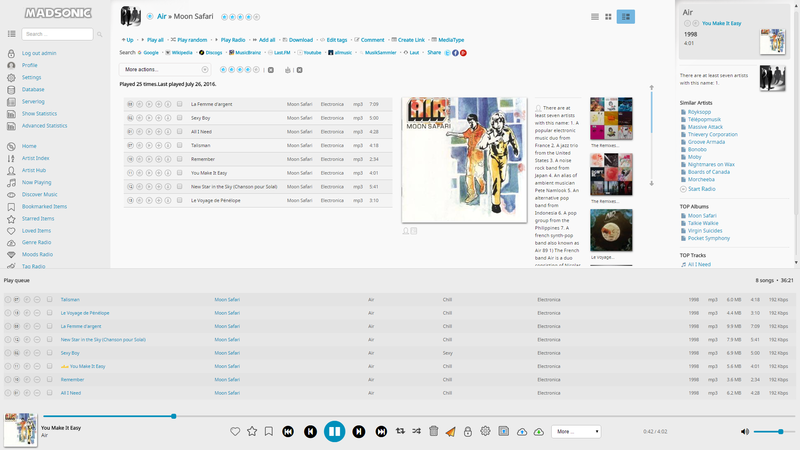 In addition to being a streaming media server, Madsonic works very well as a local jukebox. The intuitive web interface, as well as search and index facilities, are optimized for efficient browsing through large media libraries. Clients can connect via the built in website or with many other clients that support the Madsonic/Subsonic REST API. Madsonic is a fork of the awesome Subsonic Server. Madsonic is designed for people who want more from the vanilla features. Listen to your music from anywhere – all you need is a browser. The clean web interface is optimized for constrained bandwidth environments and efficient browsing through large music collections (hundreds of gigabytes). Administer the play queue (add, remove, rearrange, repeat, shuffle, undo, save, load). 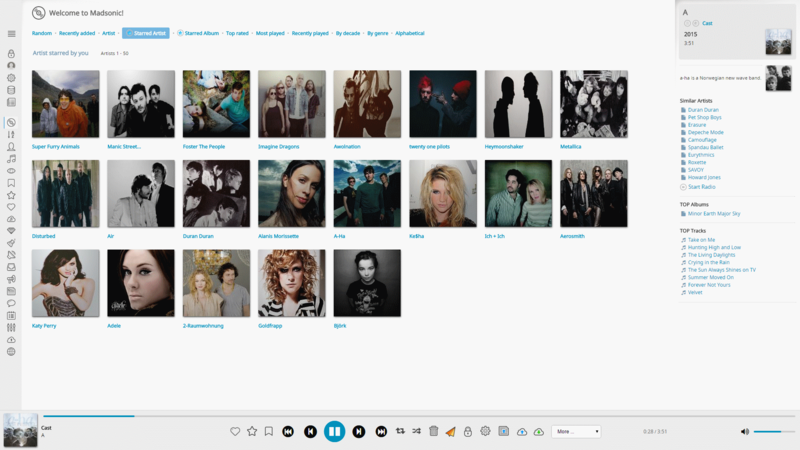 Create your own playlist and share them with other users if you like. Free-text search helps you find your favorite tracks quickly. Displays cover art, including images embedded in ID3 tags. 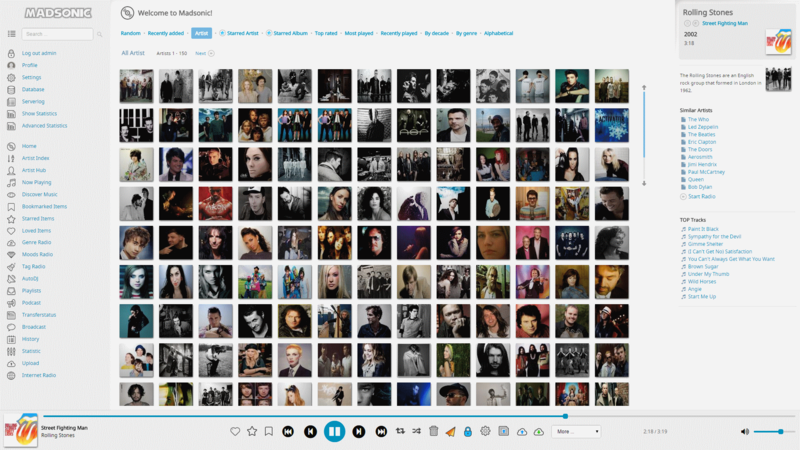 Star your favorite artists, albums and tracks. Assign ratings and comments to albums. Supports MP3, FLAC, OGG, AAC and any other audio or video format. Transcoding engine allows for streaming of a variety of lossy and lossless formats by converting to MP3 on-the-fly. Works with any network-enabled media player, such as VLC, Winamp, iTunes, XMMS and Windows Media Player. Also includes an embedded HTML5 player. Tag parsing and editing of MP3, AAC, OGG, FLAC, WMA and APE files, using the Jaudiotagger library. Playlists can be imported and exported. M3U, PLS and XSPF formats are supported. Saved playlists are available as Podcasts. On-the-fly resampling to lower bitrates using the high-quality ffmpeg encoder. Handy if your bandwidth is limited. 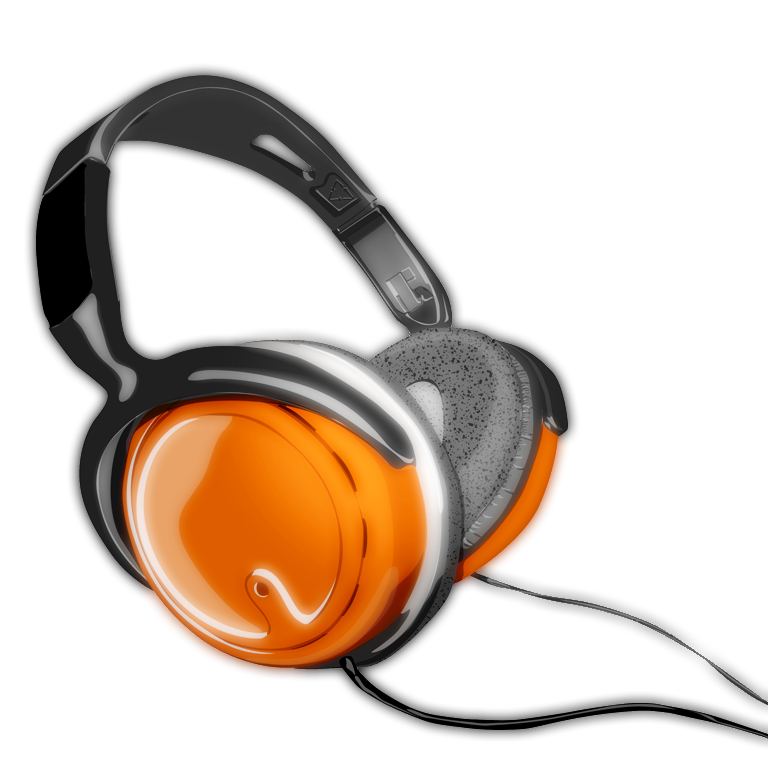 Implements the SHOUTcast protocol. 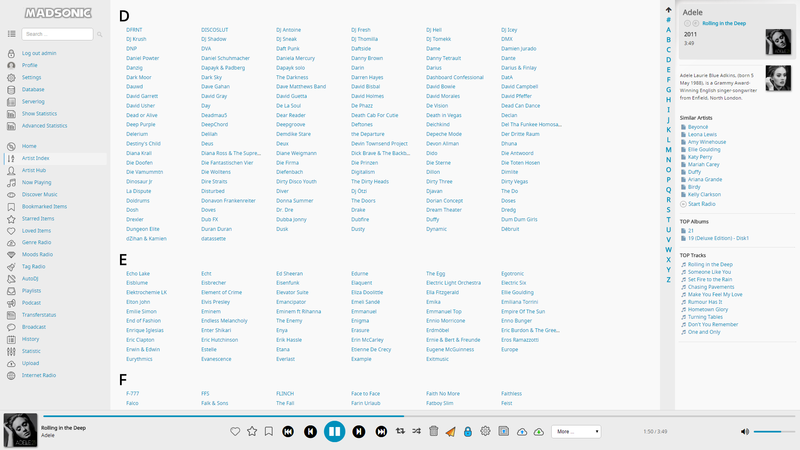 Players which support this (including Winamp, iTunes and XMMS) display the current artist and song, along with other metadata. Stream music directly to your phone. Many apps available. Works with any number of users, and any number of simultaneous players. Access your server using your own yourname.madsonic.org address. Open REST API for app developers. 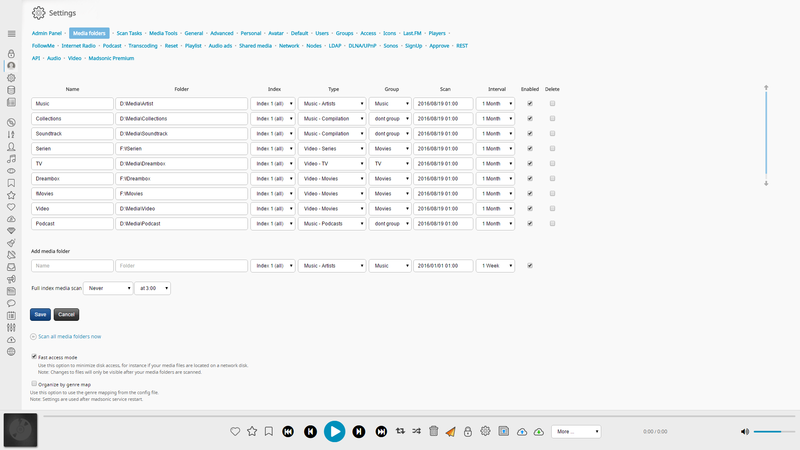 Automatically register what you're playing on Last.fm, using the built-in Audioscrobbling support. 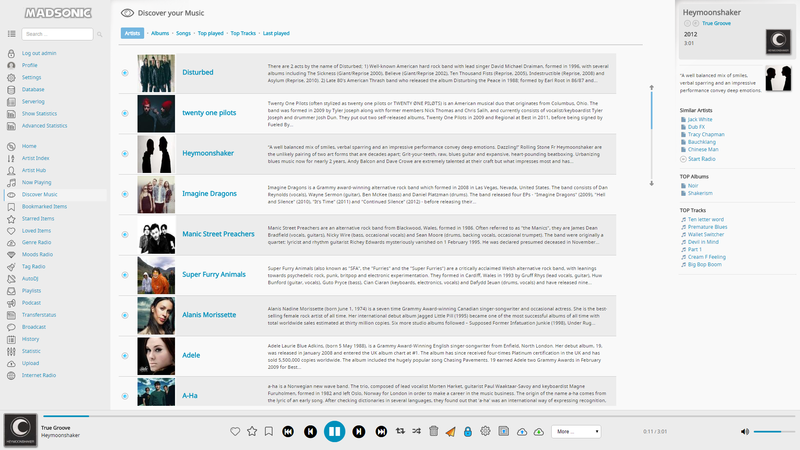 Find cover art and lyrics using web services from Last.fm, Google and Chartlyrics. Read album reviews and more at Wikipedia, Google Music, Youtube and allmusic. Users must log in with a username and password. Users are assigned different privileges. Use HTTPS/SSL encryption for ultimate protection. Specify upload and download bandwidth limits. Browse by genre, moods and decade. Manage your internet TV and radio stations. Download Podcasts with the integrated Podcast receiver. Play music directly on the server's audio hardware using the jukebox mode. The basic version is free. In addition, the premium features are available for 30 days so you can try them out before deciding to upgrade.